Upgrade the entry to Kings Domain at Linlithgow Avenue. Investigate a new ridge and tree top walk. Work with Victorian Arts Centre Trust to upgrade access and interface with Sidney Myer Music Bowl. This will include removing and relocating toilets. 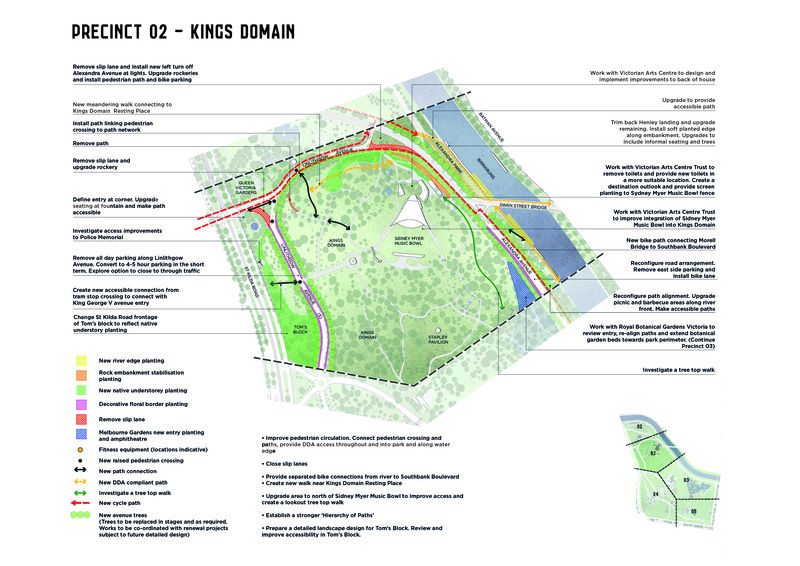 Provide new meandering walk connecting to Kings Domain Resting Place. Create new dedicated bike path connecting Morell Bridge to Southbank Boulevard. This will include repurposing car parks along Linlithgow Avenue. Remove slip lanes and upgrade rockeries. Trial road closures on Linlithgow Avenue for pedestrian and cycle use. In the short term remove all-day parking and convert to four hour parking in this location. Provide raised pedestrian crossings on Linlithgow Avenue. Provide new accessible entry at tram stop and links to connect with King George V avenue.